All of the flowers in this post are in flower today. All through the winter I have posted flowers and sometimes people leave comments about all the wonderful winter flowers that we have in the UK. Well, we don’t have winter flowers, I was just trying to cheer winter up but today we do have flowers. 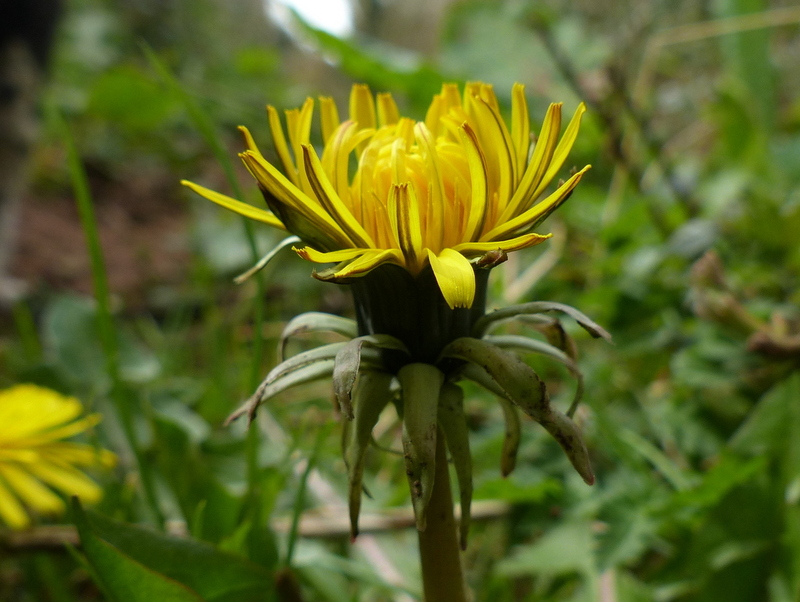 First wild flower of the day and it is yellow, it’s a Taraxacum. 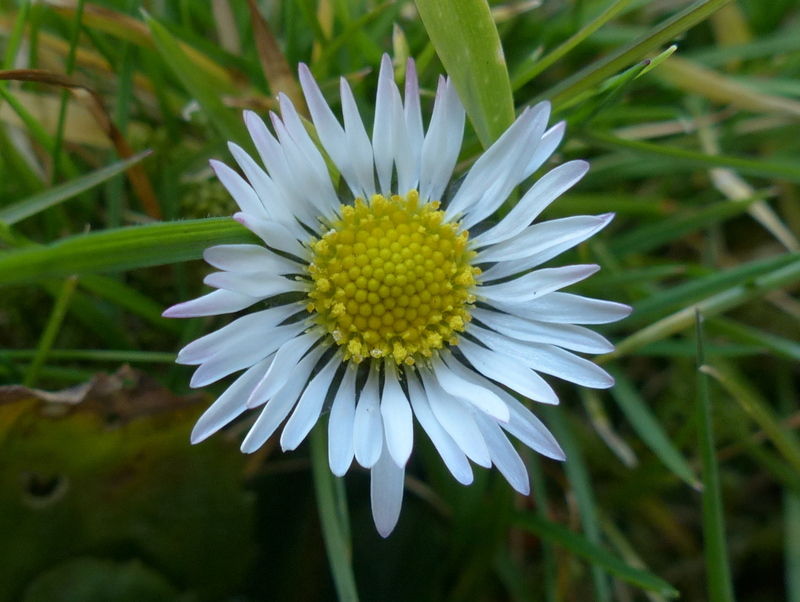 Another Asteraceae in flower now, this one is a Daisy. 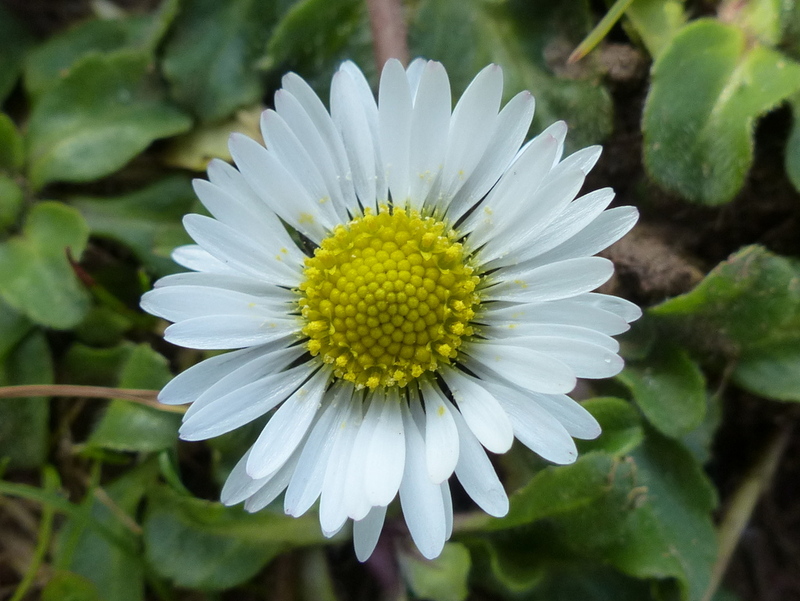 The very, very beautiful and commonplace Bellis Perennis. This next one absolutely brought joy to my heart. I missed you like I missed the warmth of the sun. 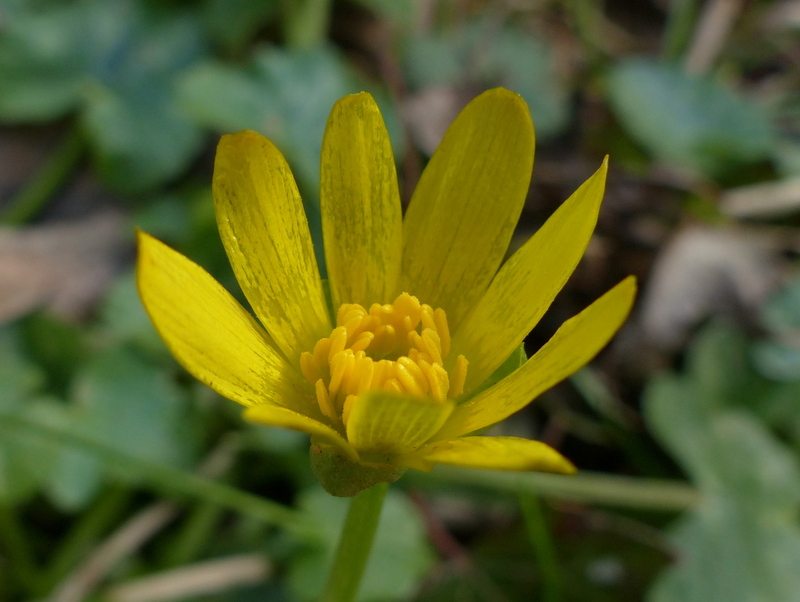 That is the Lesser Celandine. Now do you believe that it is Spring? 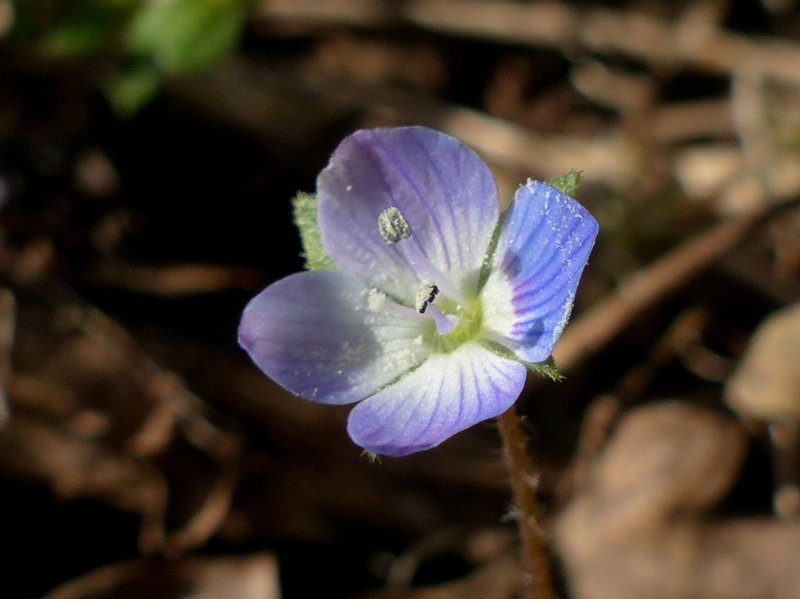 A Speedwell, of the common-field variety. They are well established and they are here to stay. 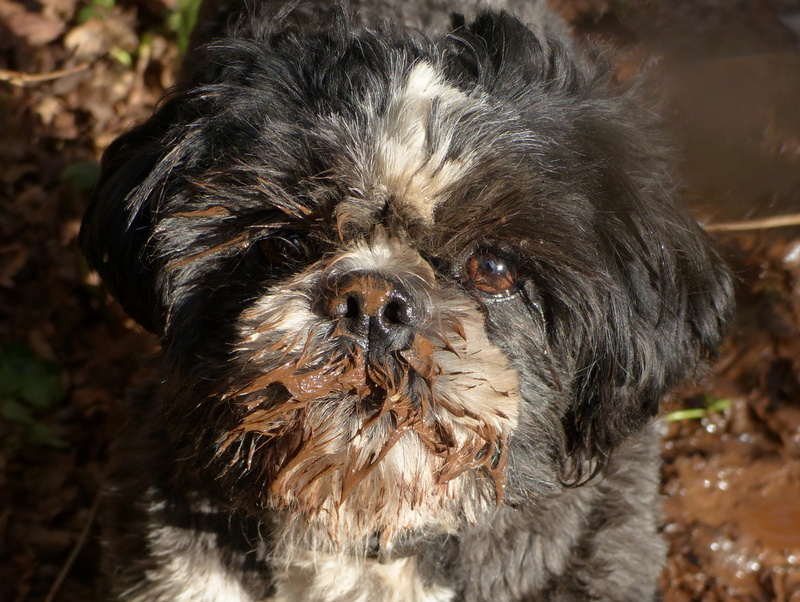 Now I gave Mudface a bit of a hard time in my last post, on account of her love of mud. 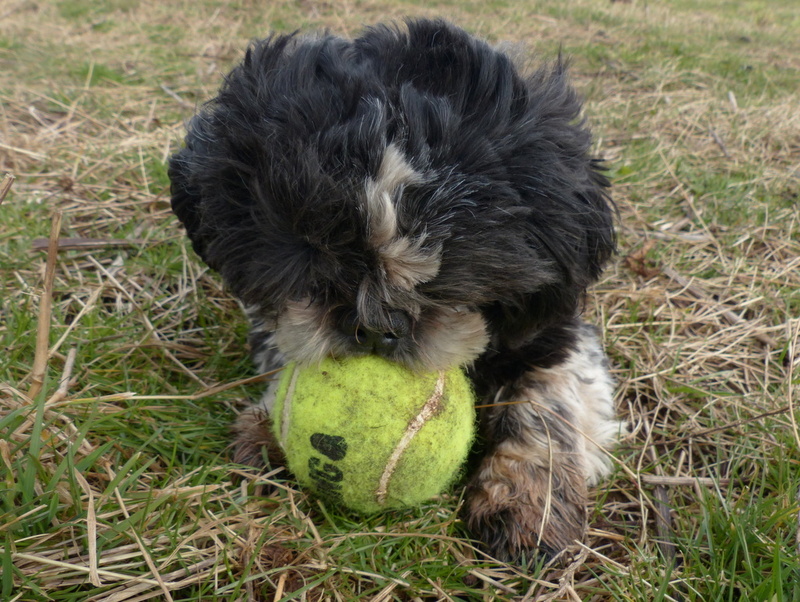 It wasn’t really fair and so to make amends, yesterday I bought her a new toy. 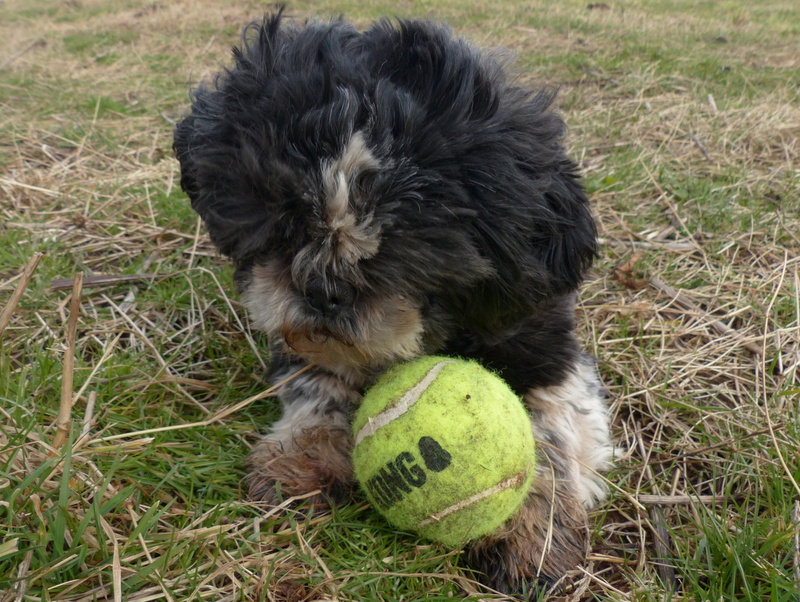 It is a squeaky ball. Does she like it? Who can tell? I am going to skip most of the stuff that we saw and we did but I have to show you a couple more flowers. 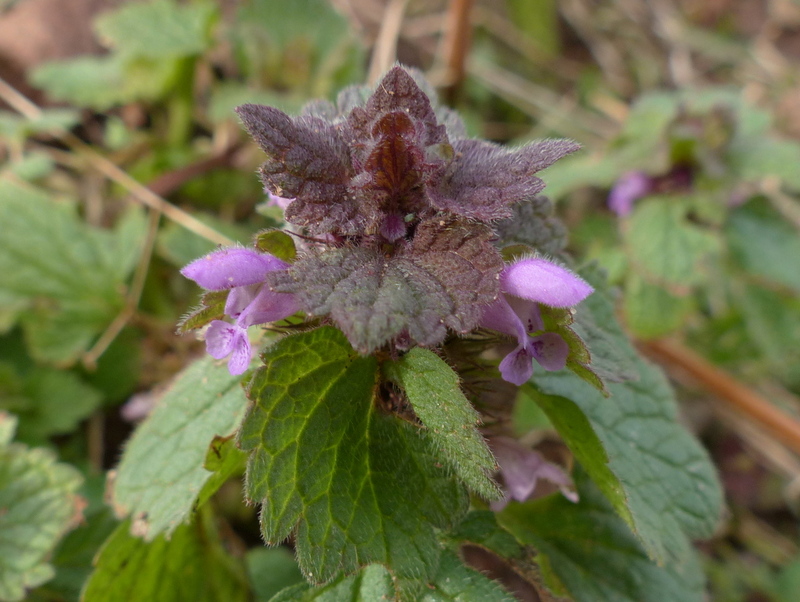 Red Dead-nettle, it is only a little weed but I find the colours absolutely charming. The Tommies are coming up. Okay that is it, one last thing. Today I discovered something wonderful…. I can put Fizz up a tree and she doesn’t fall out. No, that wasn’t it. I am never cruel to animals. I just put her in the tree for a minute to stop her pestering me. This is a new one for me and I love that. 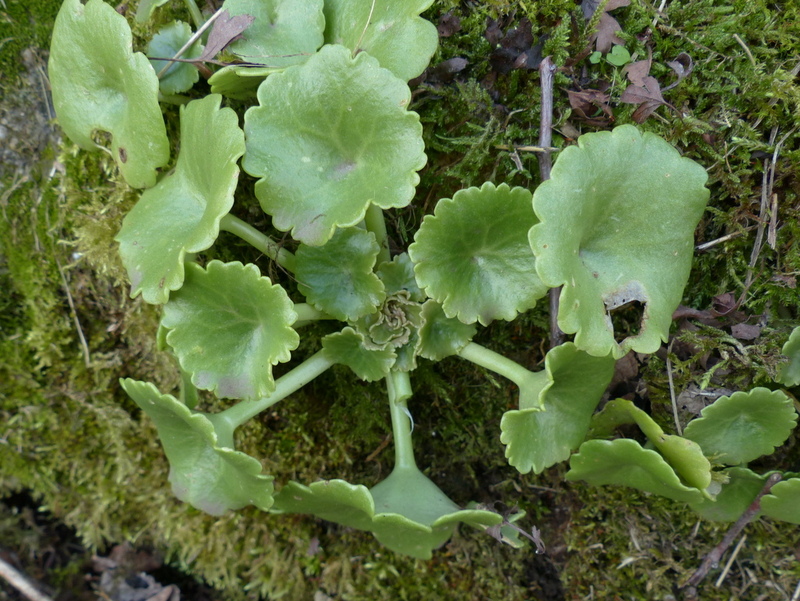 It is a succulent, native to the UK and it flowers in May. I took dozens of photographs but I will bore you later. 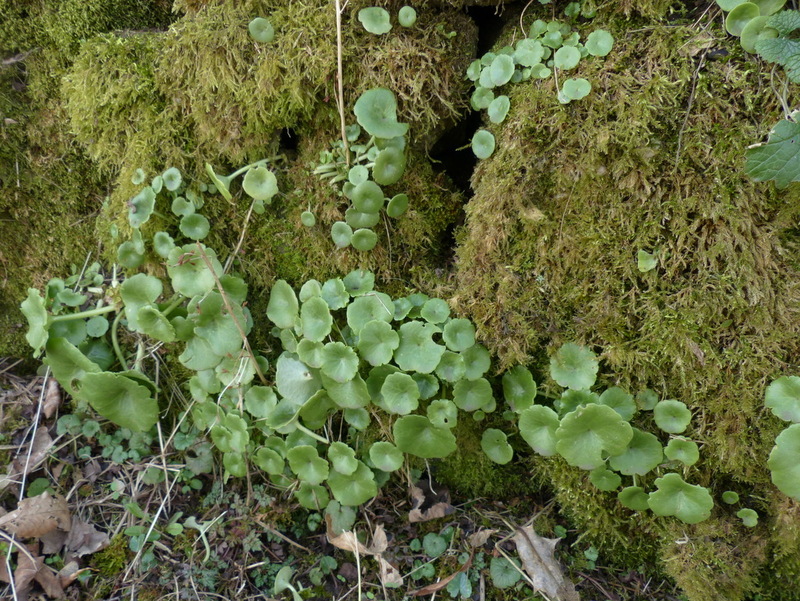 Also known as Wall Pennywort, I found it growing on a wall. One other thing that I just have to tell you. I am getting along well with taming my Robin. He lands on my hand now and takes food. He has started following me around when I go out, only in the farm yard, he doesn’t go far afield. When I brought Fizz back today He was there to welcome us back singing and following. He costs me a lot of worms but I don’t think that I have made a mistake. It is hard not to love this little animal. Heck of a long post, it is going to get longer. 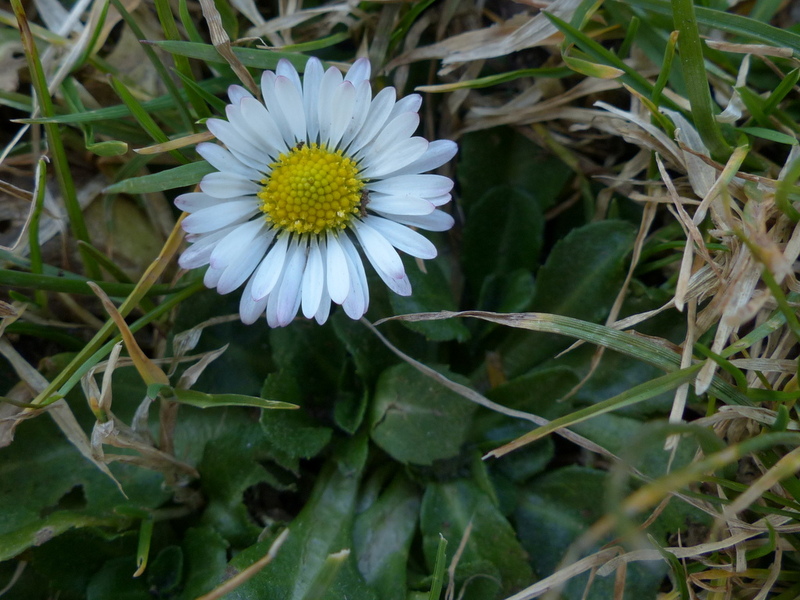 Here is my wild flower. Take care my friends. 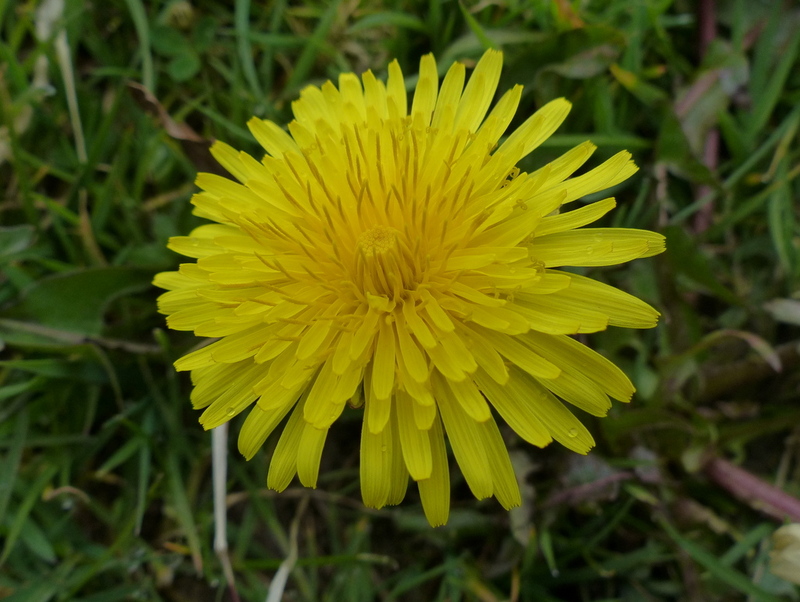 It may be that the Dandelion you see most often is Taraxacum officinale, the Common Dandelion, however there are more than 230 species of Dandelion in the UK and the differences between them are small and very complex. 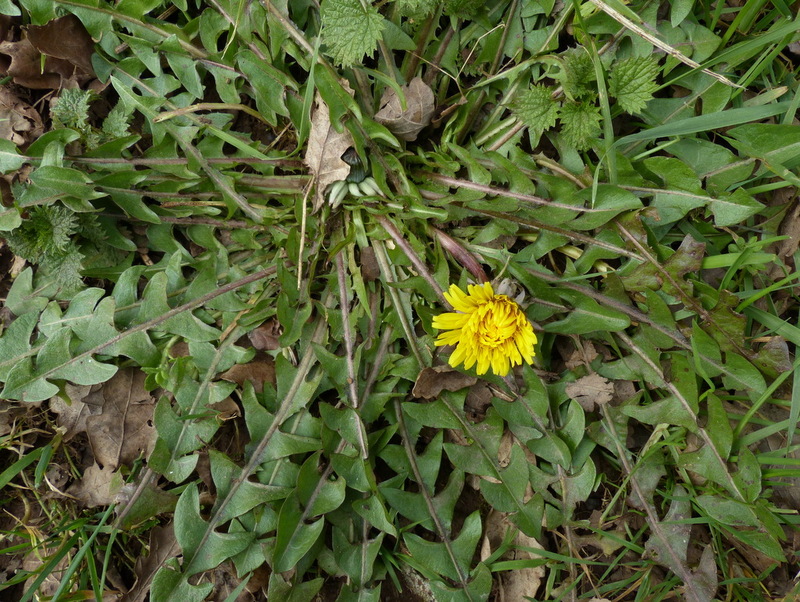 It is not possible to identify a Dandelion to species from a single photograph. Many different things have to be taken into account. The character of the leaves for instance. Some species have alternate lobes and some are opposite and there are some species that don’t have lobes at all, some have a purple central rib and in some it is pale. When you understand the leaf you then have to cross reference that with all of the other parts of the flower. 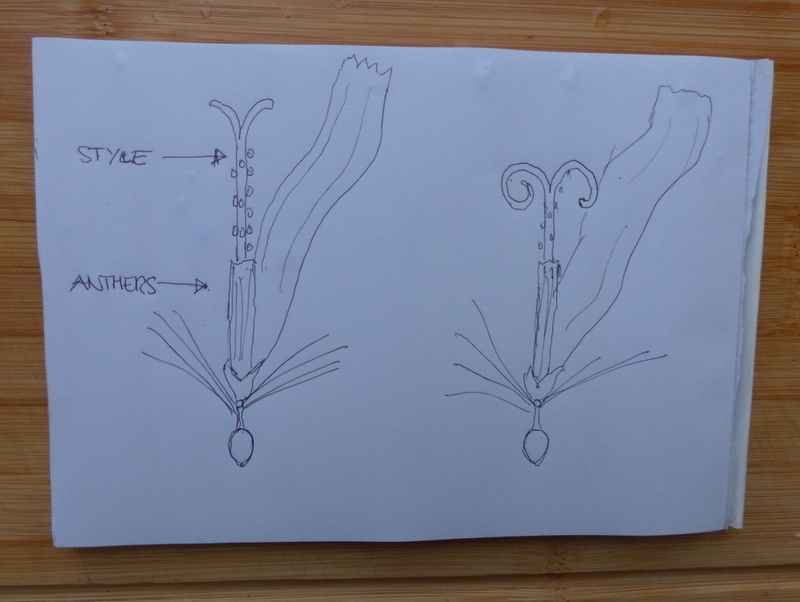 The pattern of teeth on the end of each floret for instance. 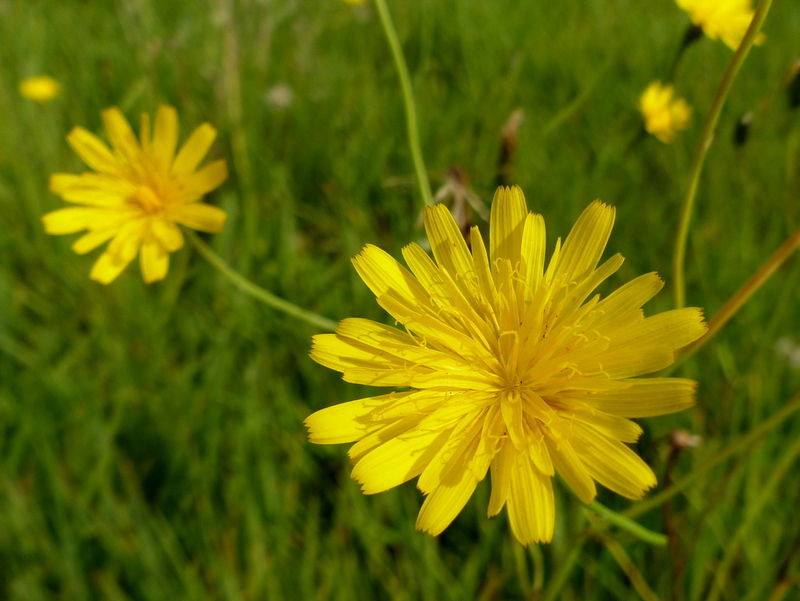 There are so many factors to take into account that identifying a Dandelion to species is a job for the experts. 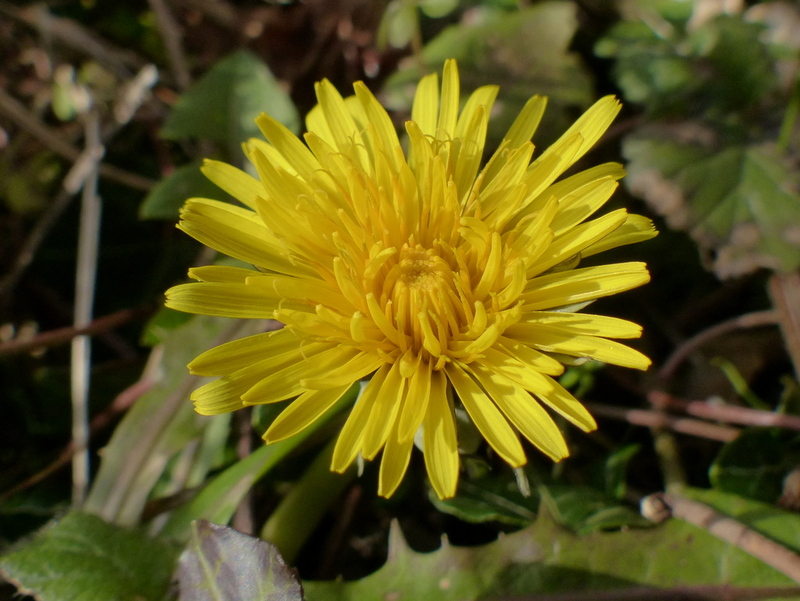 To us it is just a Dandelion, (Taraxacum species). So can we even tell that it is a Dandelion? Yes of course we can. 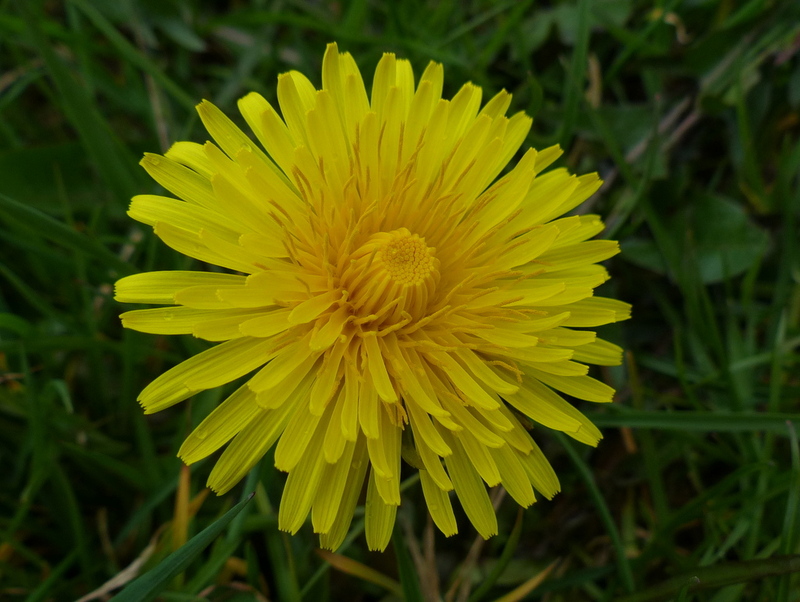 Dandelions belong to the Asteraceae (Daisy) family and they have quite distinctive characteristics. 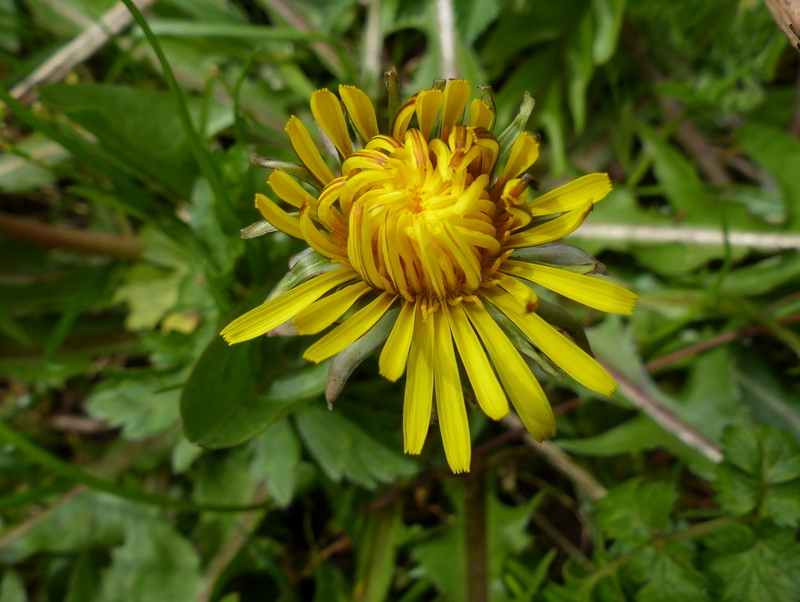 Like other members of the Asteraceae they have a composite flower head made up of many smaller flowers. 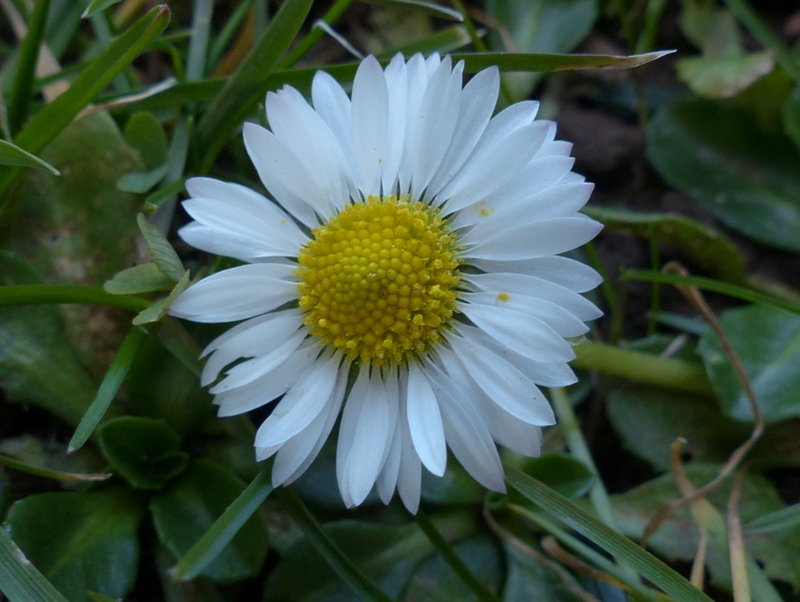 This next picture is of a Common Daisy (Bellis perennis) and shows the arrangement of central disc florets (yellow) and the outer ray florets (white), each “petal” and “disc” is a complete flower in itself and together they make the flower head that we call a Daisy. A Dandelion has no disc florets. It is composed solely of ray florets. 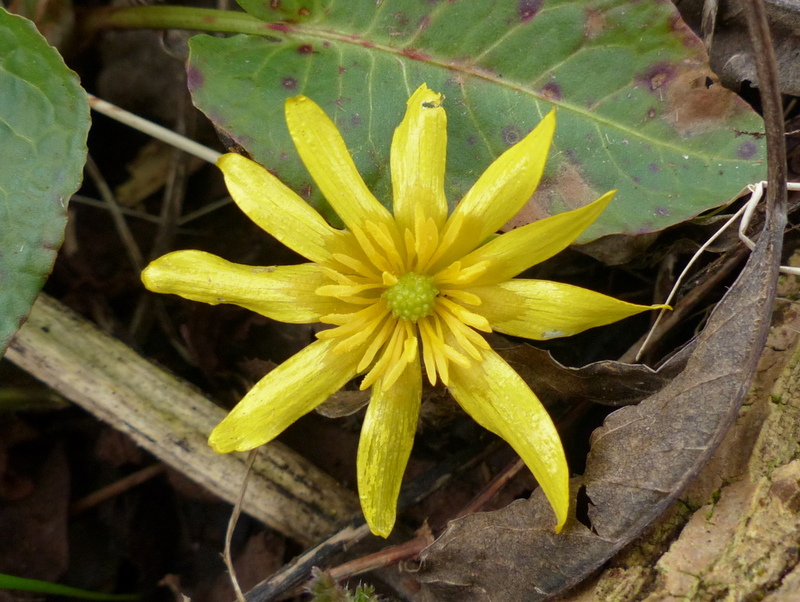 The other easy to spot and important characteristic is that unlike other lookalikes there are no leaves on the flower stem and it is unbranched, each flower head is carried on a single, bare stem. that will rule out the Hawksbits and other pretenders like Cat’s-ears. If you remain unsure then cut it. 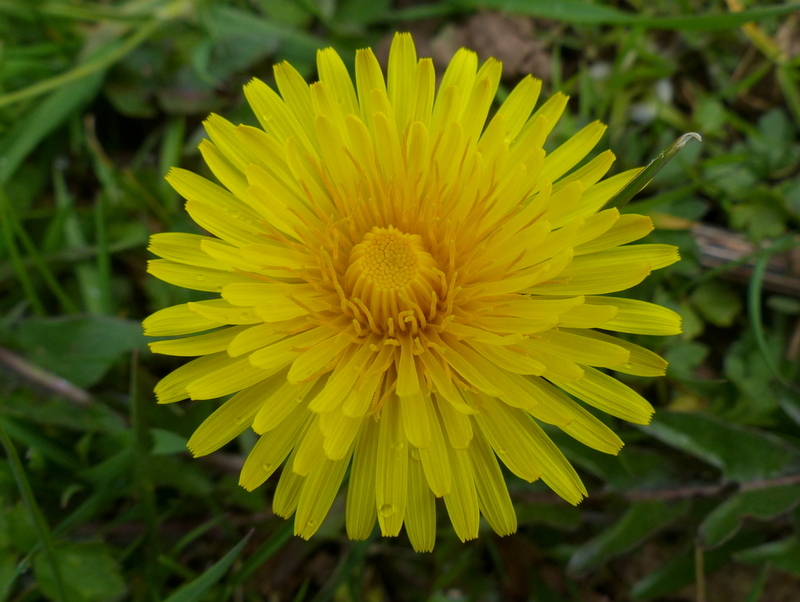 The Dandelion is the only yellow member of the Asteraceae with a hollow stem and it exudes a milky sap. 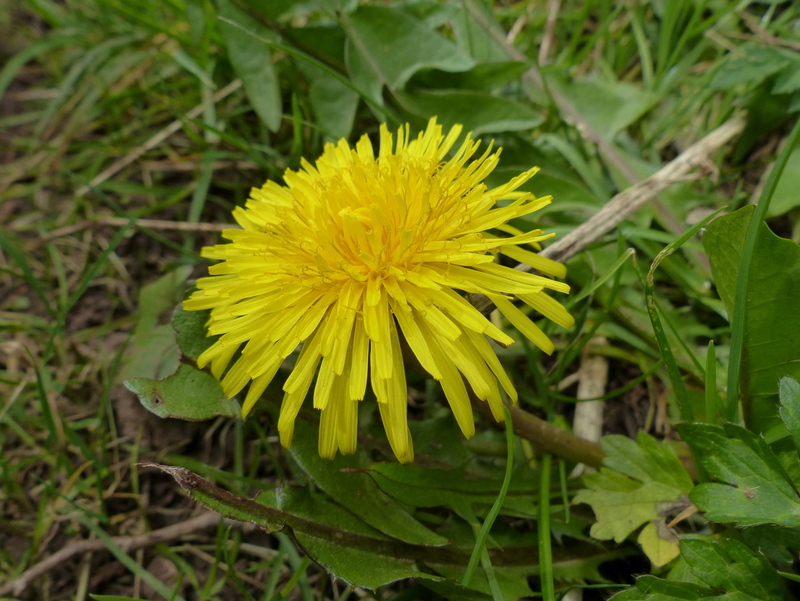 Dandelions secrete latex, not very much in the wild varieties but scientists have developed cultivars for the production of rubber and there are tests being carried out today with tyres made of Dandelion rubber. 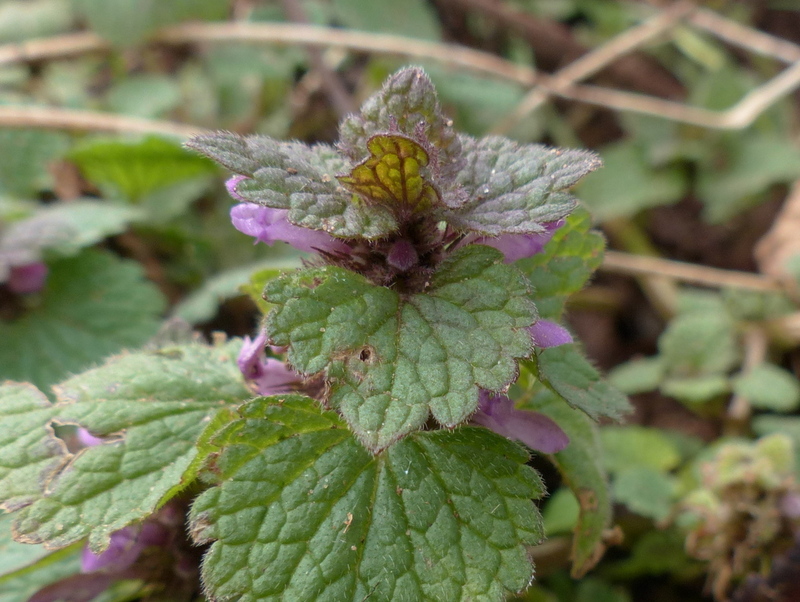 At the base of each flower there are a series of down turned bracts. These are sometimes mistaken for sepals but remember that this is a flower head and not an individual flower, each ray floret has it’s own sepals at the base which will eventually become the parachute that will carry the seed. Let’s look under the bonnet. Each “petal” is a whole flower. It has all that is required to make a flower, a corolla (fused petals) male reproductive parts and female parts too and an ovary that will become a seed. So what are all of these pointy bits coming out of the flower? They look like styles but they are covered in pollen, so that would make them stamens, right? These are the styles, the female part of the flower and they are covered in pollen that they picked up from their own anthers. I have to do a drawing to show you how this works. The anthers develop first and they produce pollen on the inside, The style grows through the middle of the anthers and collects the pollen. The style has two receptive surfaces that are pressed closely together, the pollen collected on the outside does not affect them. 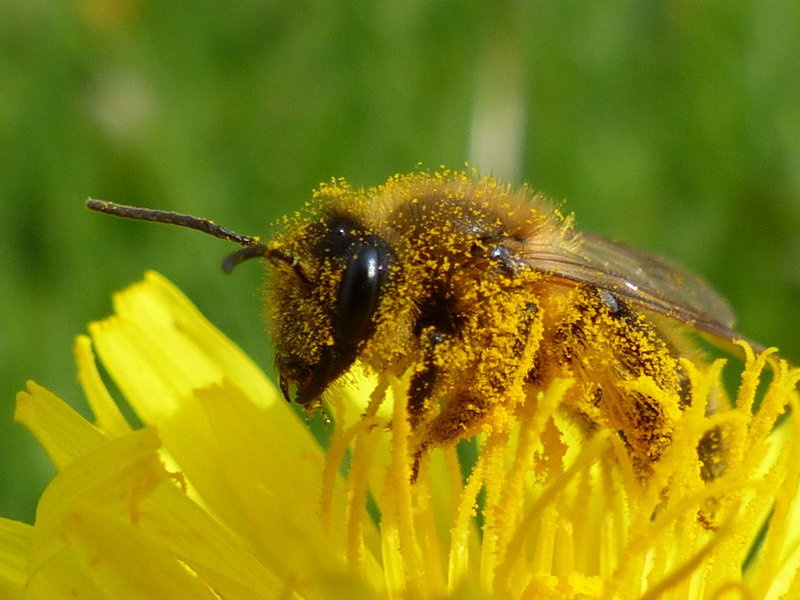 So the style carries the pollen. 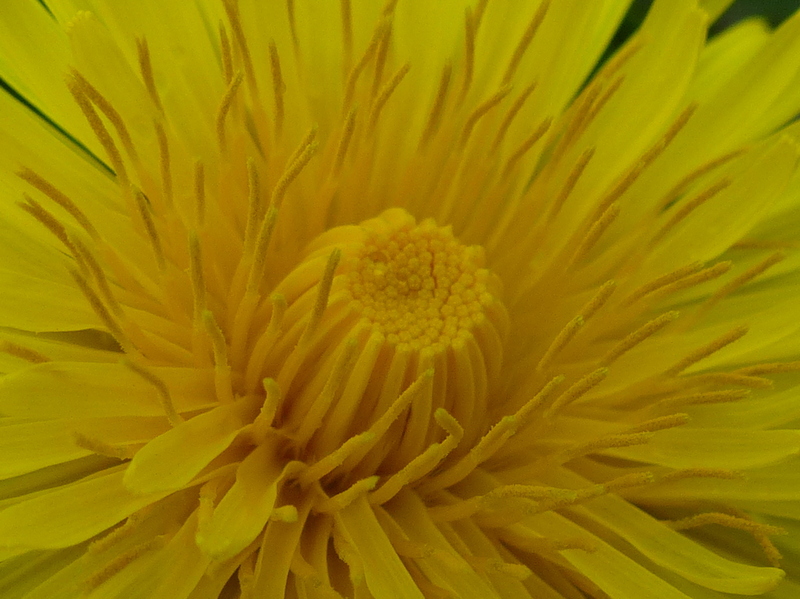 This is the best photograph that I can find to show you the anthers on a Dandelion. 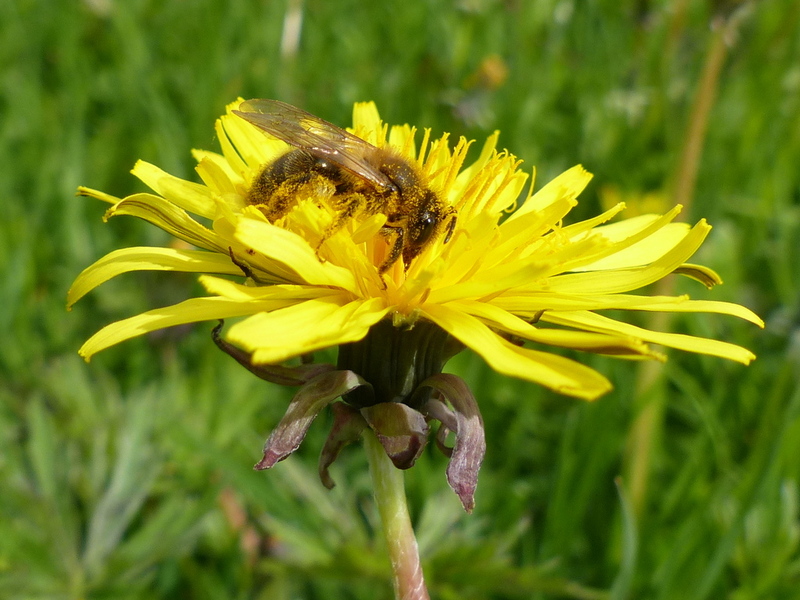 Dandelions produce a lot of pollen. 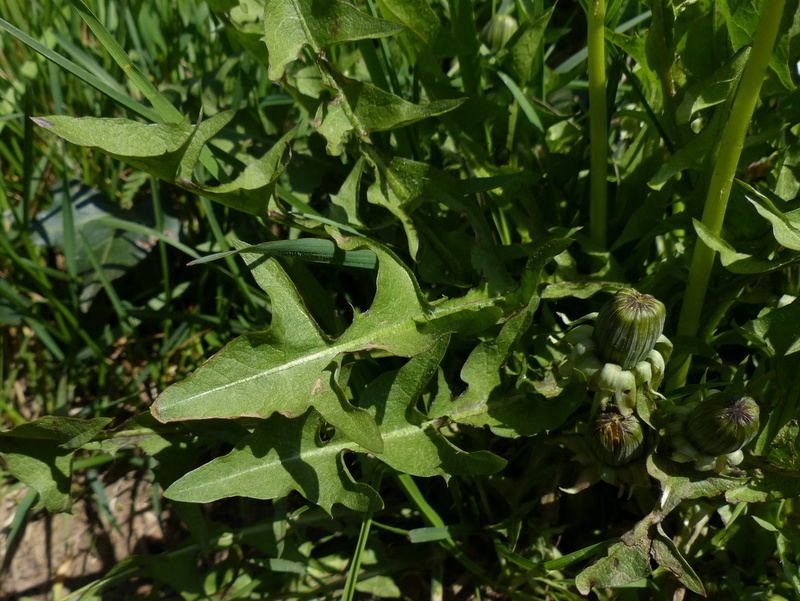 Strangely all of this sexual stuff is not really necessary, most Dandelions are capable of asexual reproduction and their seeds do not require second party fertilisation but it is fun. 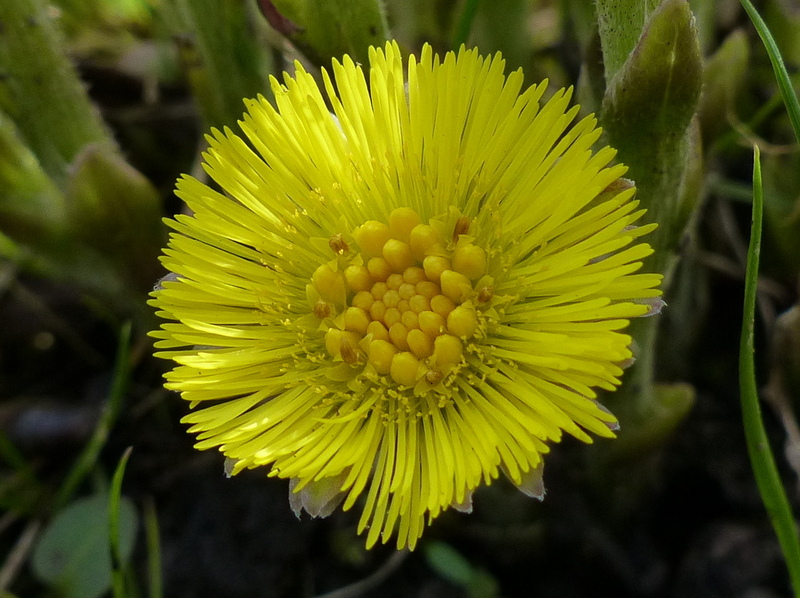 With 230 plus species in the UK you can pretty well find Dandelions in flower at any time of year, they don’t all flower at the same time, however there is a season. 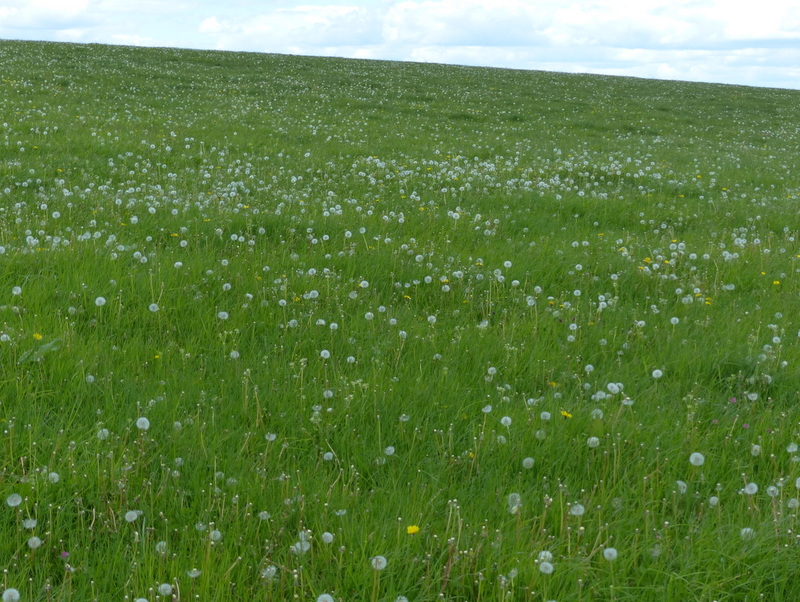 April is the best time to look for Dandelions, the fields are full of them. By May they will be spent. You will never see a Dandelion with some petals and some seeds, the transformation seems to be instant and total, they close as a flower and when they open again they are a seed head. The seeds are called achenes and the parachute is called a pappus and the parachute is actually made from modified sepals of the tiny flower called a ray floret. Between the seed and the parachute is a stem called a beak. The whole of this structure has grown from the style that both distributed and collected pollen for the flower. 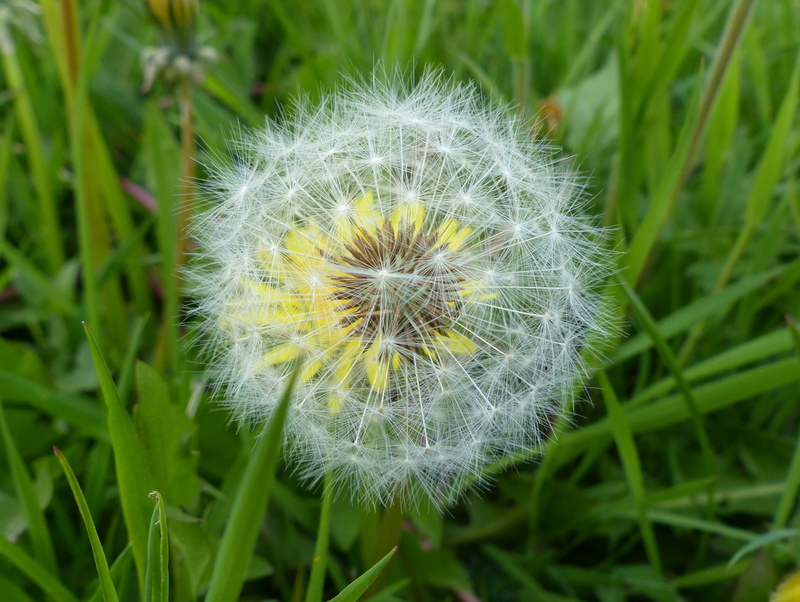 These are the Dandelion clocks of our childhood, you can tell the hour by the number of breaths it takes to disperse the seeds. They are not firmly attached so it is usually early. 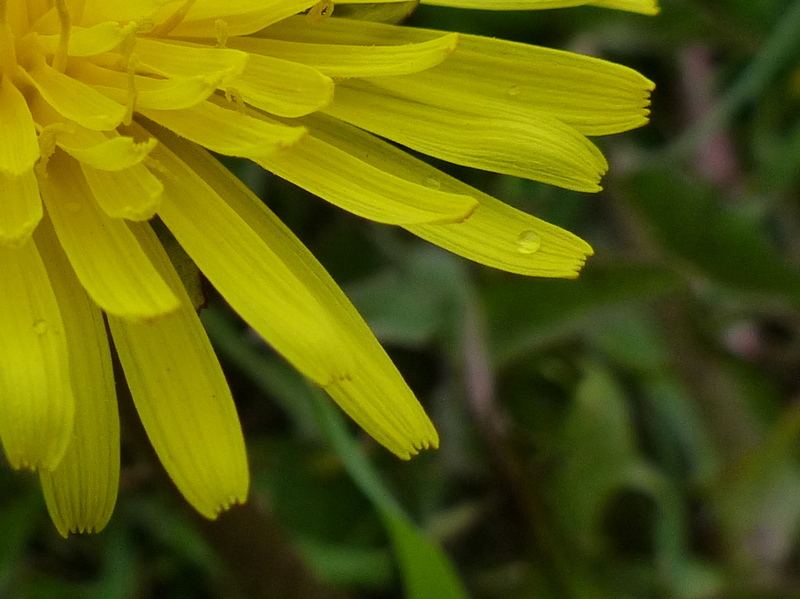 The Dandelion weed is without doubt one of our most beautiful wild flowers. I am not really sure why it hasn’t been modified and cultivated for the garden. 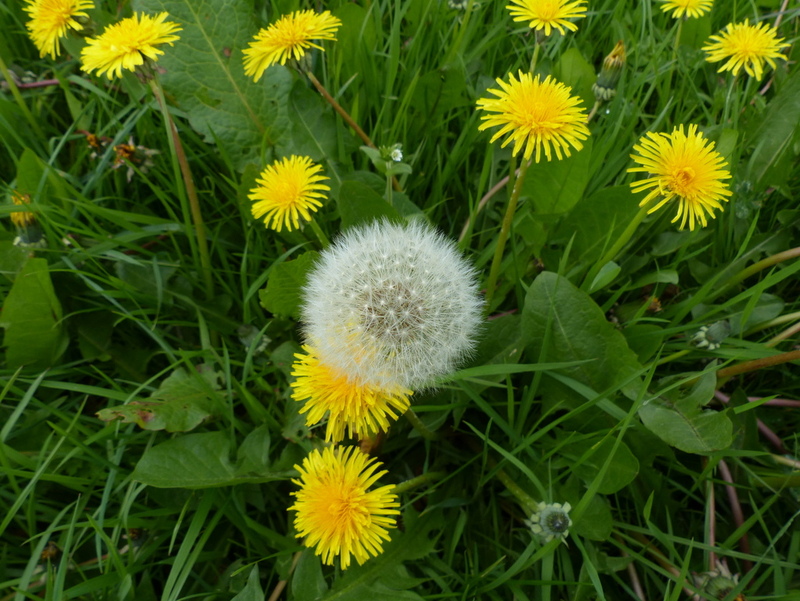 Dandelions are a very good weed to have in the garden, they have a very deep tap root that draws nutrients up to the surface and makes them available for other, more fancy, flowers. They also attract pollinators. 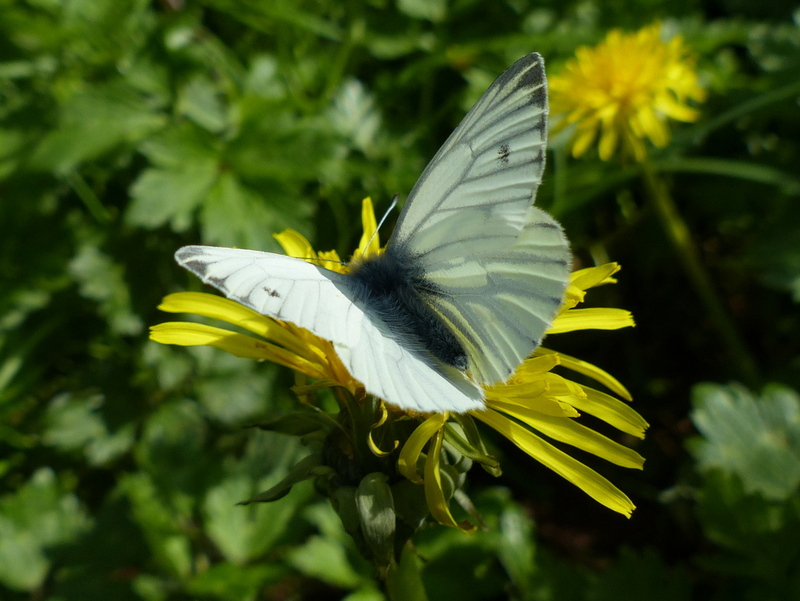 Dandelions are the food plant for at least twelve species of moth and many other invertebrates. 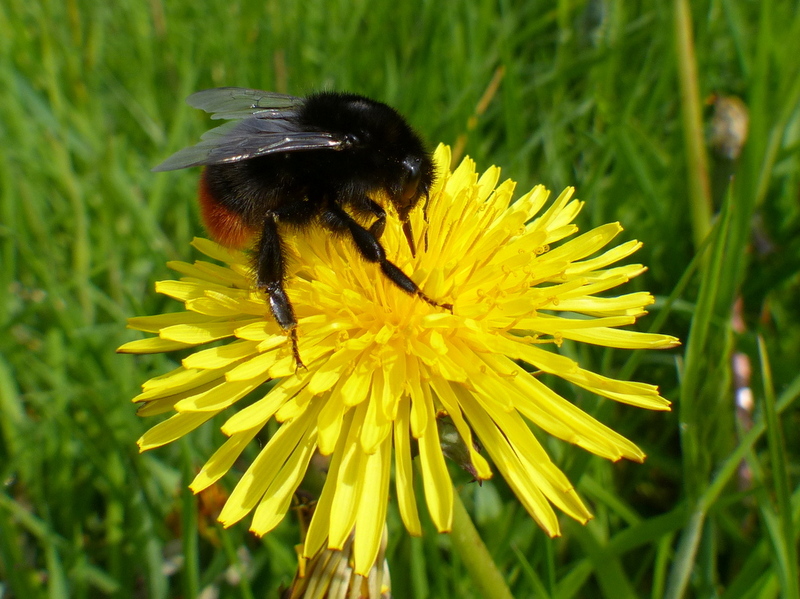 They are rich in nectar as well as pollen and are an important food source for bees. 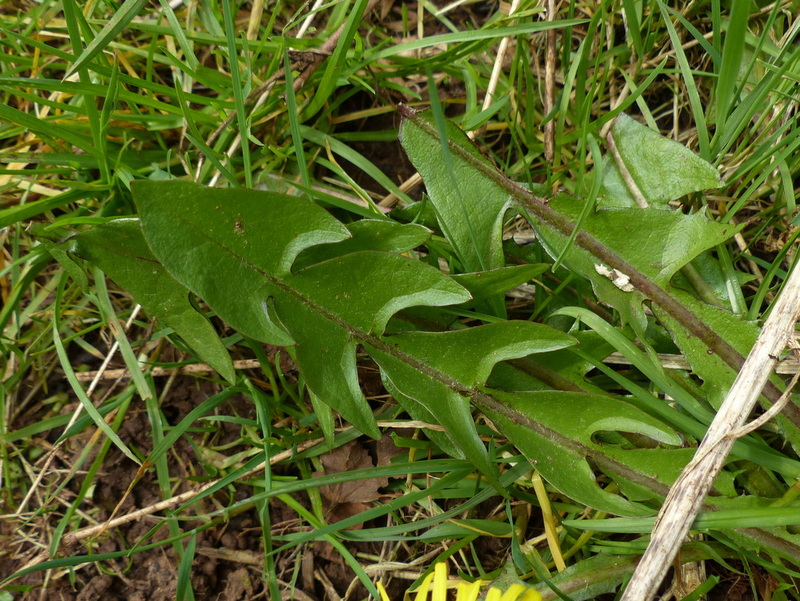 They are also good for us to eat, all parts of the Dandelion are edible. 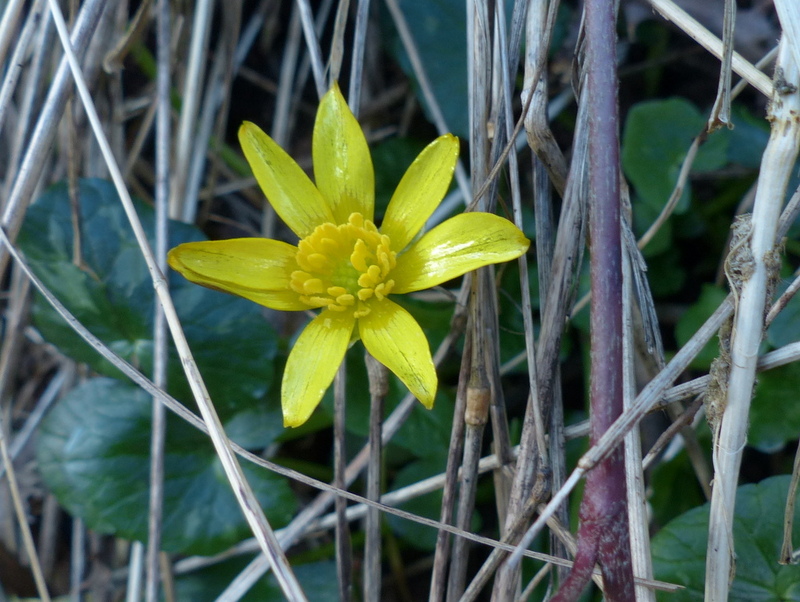 There is something that I should tell you about this beautiful and useful wild flower, it has a wicked side. 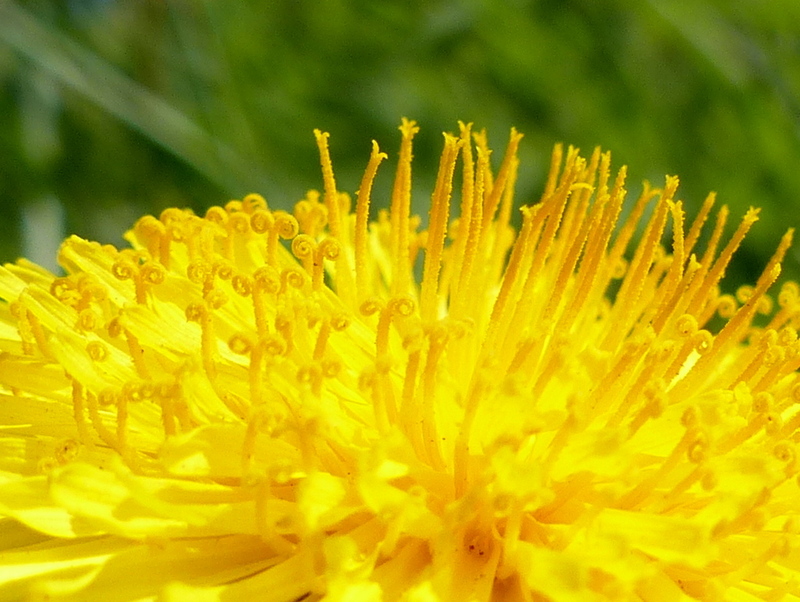 The common French name for a Dandelion is “Pissenlit” and “lit” is the French word for bed. There is some logic in this, Dandelion root has been used in herbal medicine as a diuretic and it does indeed make you piss en lit. 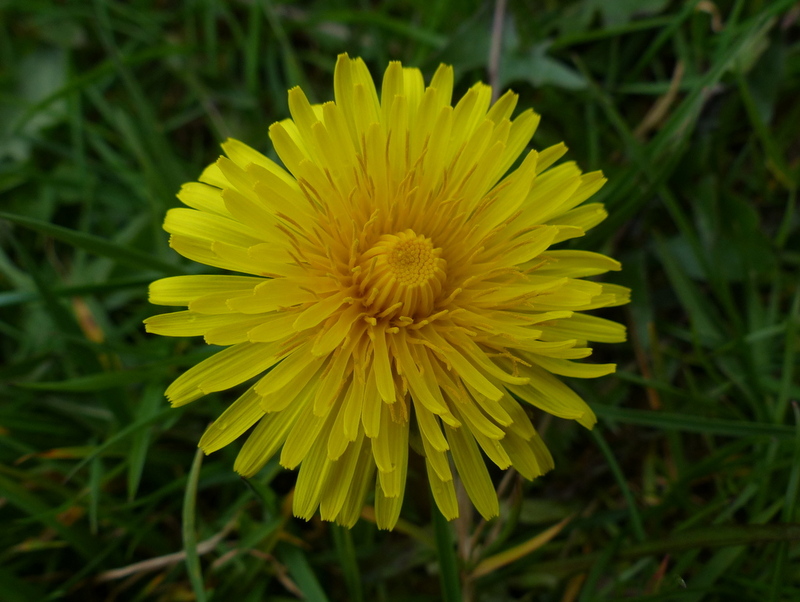 Our own common name Dandelion is derived from another French name “Dent de Lion,” meaning Lion’s tooth and that is a reference to the shape of the leaf. BTW In case you wondered, that lump that you sometimes see in the centre of a new flower is just ray florets that haven’t opened and expanded yet. Lovely post. And sometimes we get to hear your voice, which is nice, and now we heard Fizz’s as well. 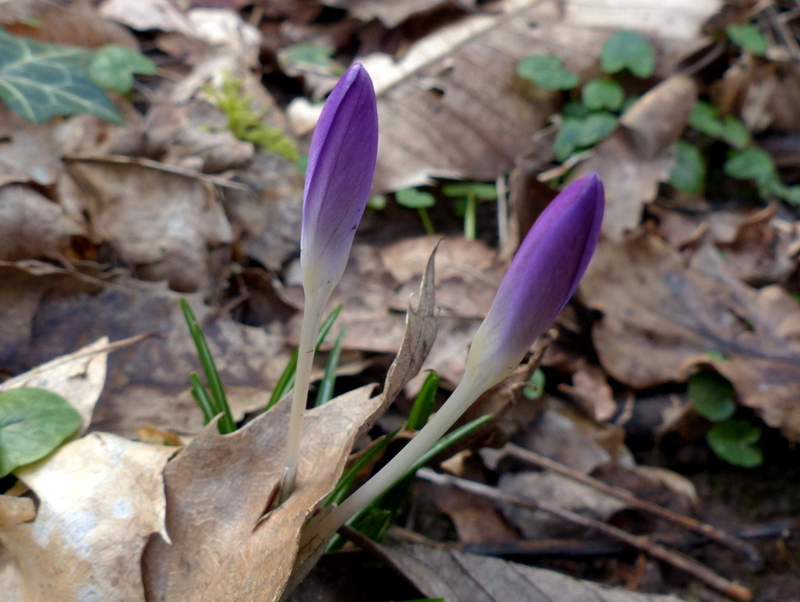 I’m so tired of winter that I’ll be very happy to see my little crocus and dandelions. It’s been a long, strange trip this winter. I hope your spring is there to stay. 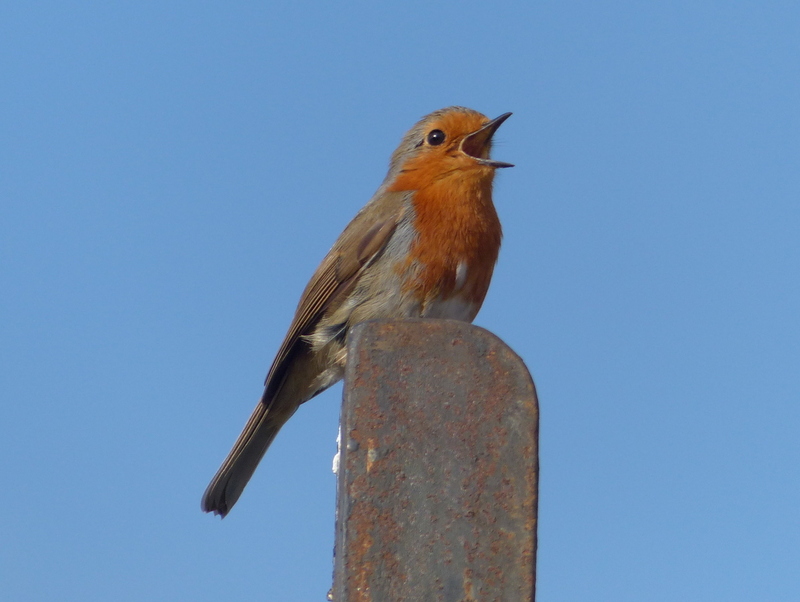 And that your robin keeps greeting you with lovely songs. Thank you Sarasin 🙂 I think that we are all fed up with winter. Never mind it will be March soon. This is a wonderful time of year, everything is coming back to life and it is all to look forward to. I can’t wait. Me too. After our spring bulbs come up, very quickly pink and white flowering trees begin their spring show. My favorite time. 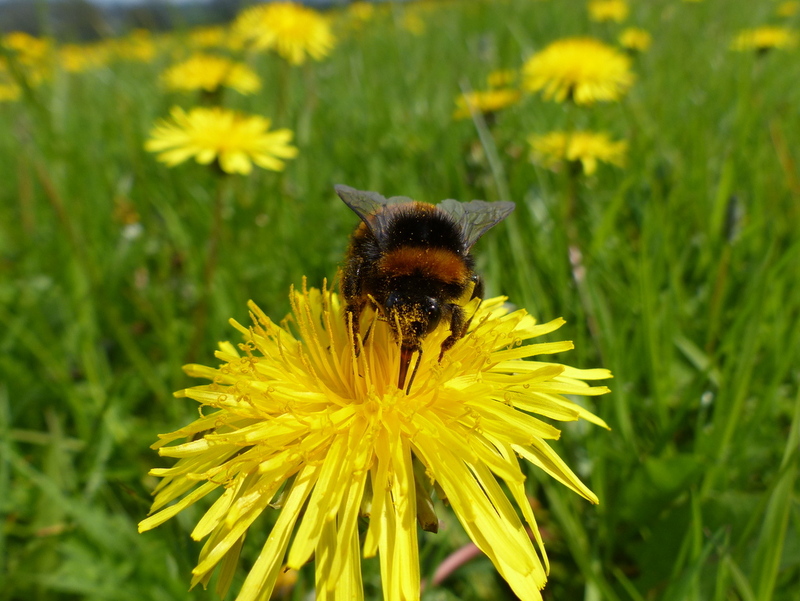 Fascinating fact about the dandelion latex – had no idea! I usually cut them a few inches below ground, hopefully before they seed. 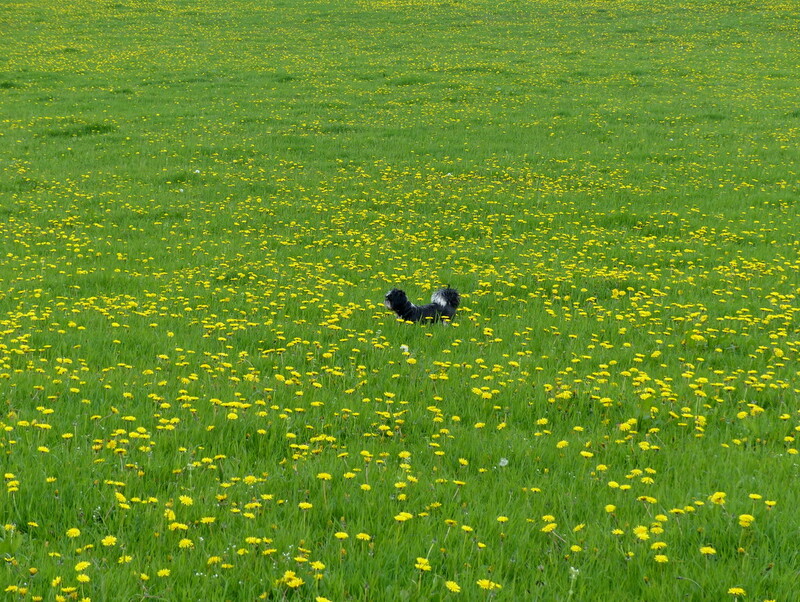 It requires vigilance, and is made all the more frustrating for the fields of dandelions in the neighbor’s yards. 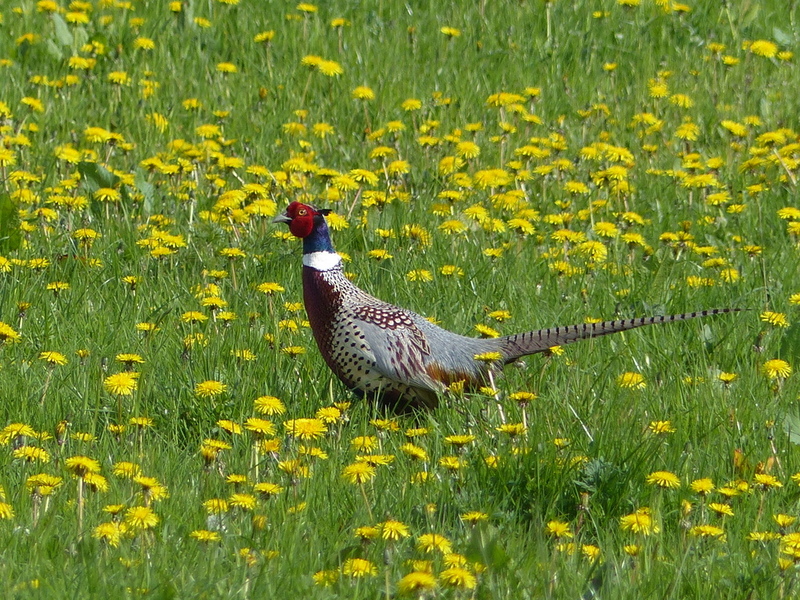 I’m thinking of investing in a dandelion shotgun; it will make keeping them from the yard a bit more fun. But why keep them from growing at all, when they’re so pretty and food for pretty insects too? Just grass is boring! Don’t misunderstand me . . . I don’t like grass either, and I no longer water it (they don’t even make a grass shotgun). I’m leaning toward rocks as perfect for a yard. Plus, if I have weeds flowering, then the flowers I do have don’t get as many insects. 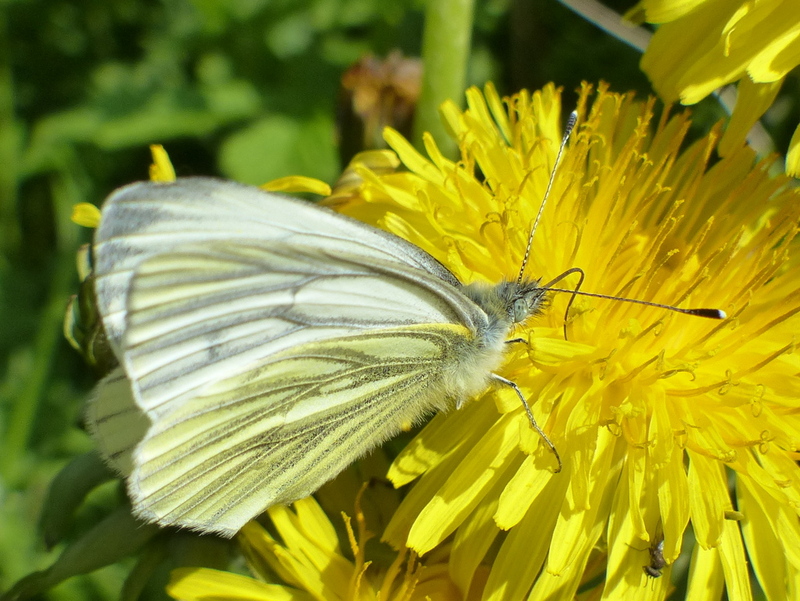 I don’t know if you know this, but to photograph an insect on a dandelion flower I would have to lay flat on the ground. If they are on my flowers, I just have to kneel. Much easier on the back. Thank you Emilio 🙂 That reminds me of a friend I knew some time ago when I was working in London, he filled his garden with plastic flowers for year round colour and low maintenance. Lovely post, Colin! 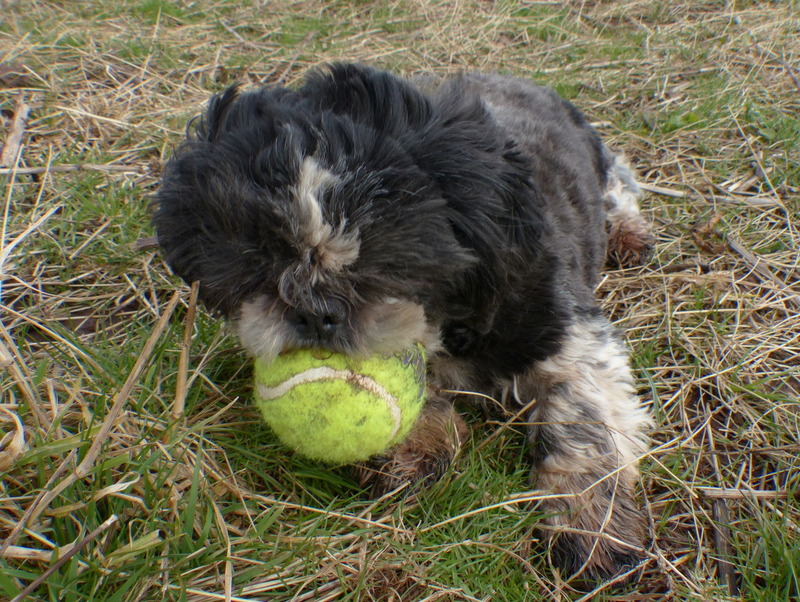 I want Fizz’s ball if she doesn’t – I could have a lot of fun with that. Beautiful photos of your Robin and all the flowers (Wasn’t it a lovely day today?) 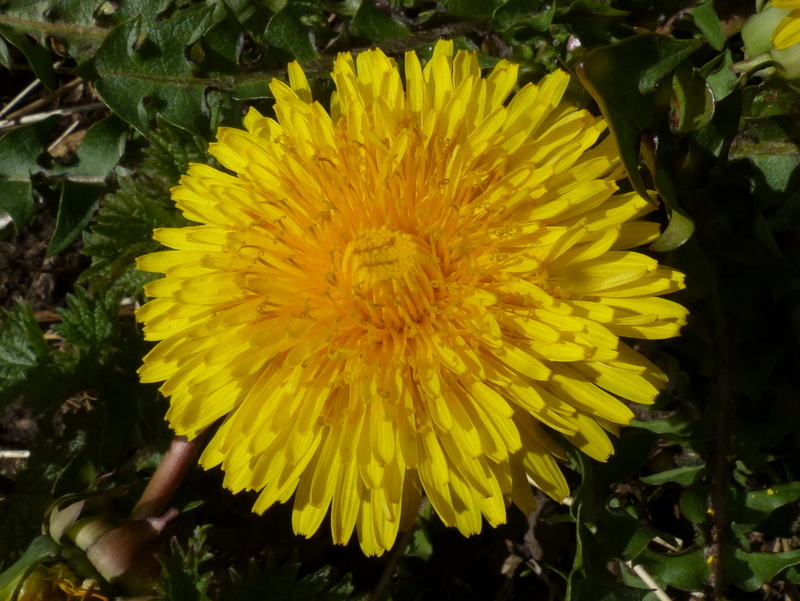 I like dandelions very much because they are bright and yellow but they do tend to take over my flower-beds. Thank you for a fascinating post. I had no idea there are so many types of dandelion. I will look at the ones in my lawn with more interest now! I never knew that a dandelion was actually a real flower. 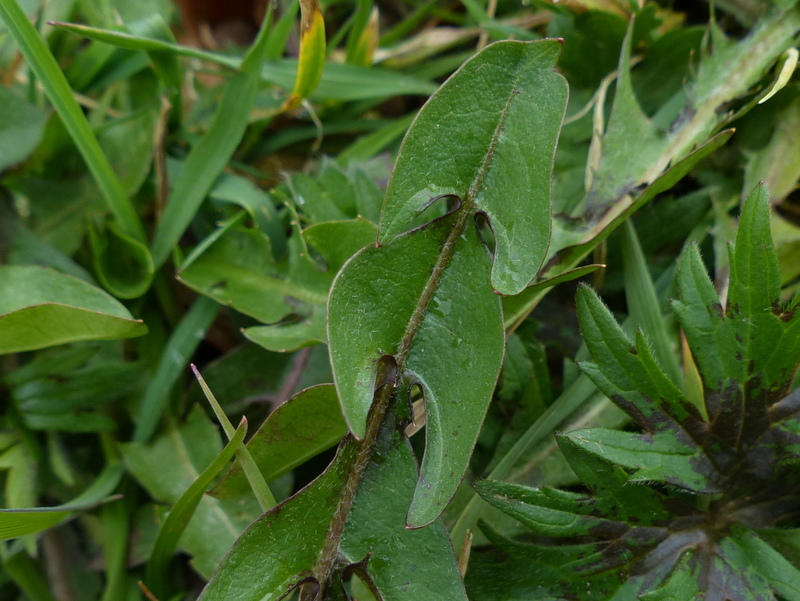 We’ve always called it a weed and done our best to kill them when they inevitably find their way into our lawn. 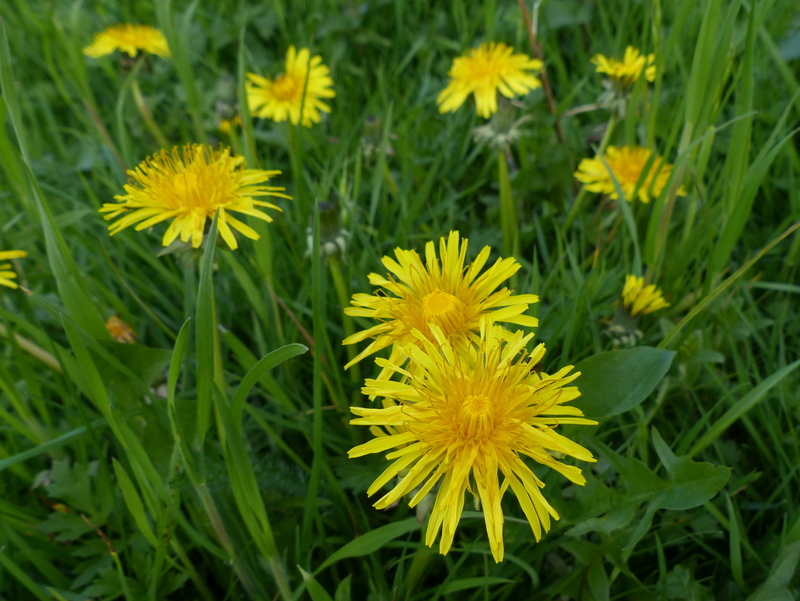 I personally love them and for the past four or five years we have stopped treating the lawn for “weeds” and thus our lawn is considered the “eye-sore” on the block, riddled with dandelions. I have always loved them, especially when the kids would bring me bouquets of them every spring. Now I can safely proclaim to my neighbors that these are actually real flowers just like the tulips and marigolds they all plant. We too are beautifying the neighborhood — just the natural way. Thank you Tilly 🙂 That’s great to hear. A weed is just a flower in the wrong place. 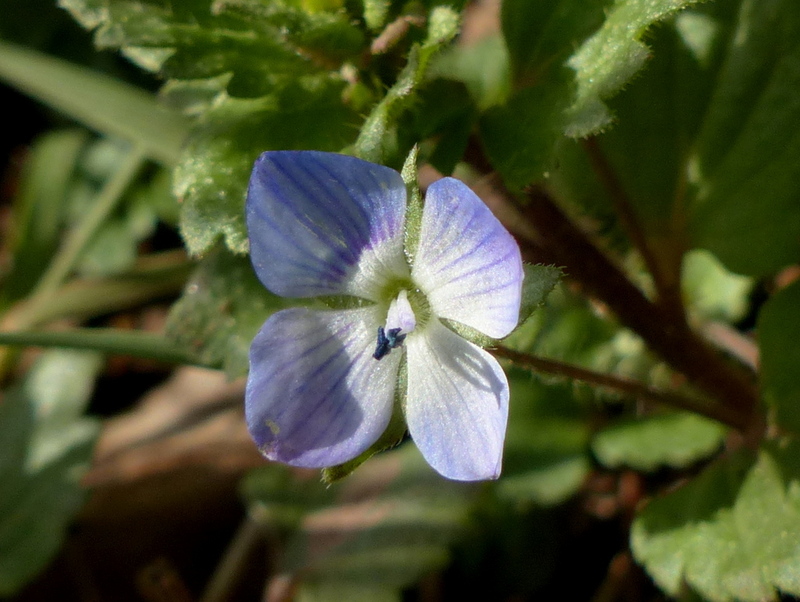 Most of our native wild flowers are weeds in a garden. Gardeners select flowers that are big and fancy and often very alien and they prize them for their looks. Native wild flowers fill a different role, they are part of the whole cycle of life that is around us, they support insects and insects support everything else that is alive, the animals and birds and the trees and flowers that they pollinate. I like a nice garden as much as the next person but gardens are not what interests me, I like the wildlife and I value the weeds far above the showy garden blooms. Sorry Lefty 🙂 I have just read yesterdays post. Thank you for your comment and well done, I didn’t notice any typos. I hope that your hand gets better soon and that it is just a sprain. A tribute to dandelions! I can’t help but love them. Colin, you have a way of bringing joyful childhood memories into adulthood. Have you eaten the root? I found it was more tasty than expected. Thank you Crystal 🙂 I haven’t eaten the root, generally I don’t like to uproot plants but we do have millions of Dandelions on the farm so I will try it this spring. I really love plants that children play games with, it was a part of my childhood and I like to think that children still do play with flowers. 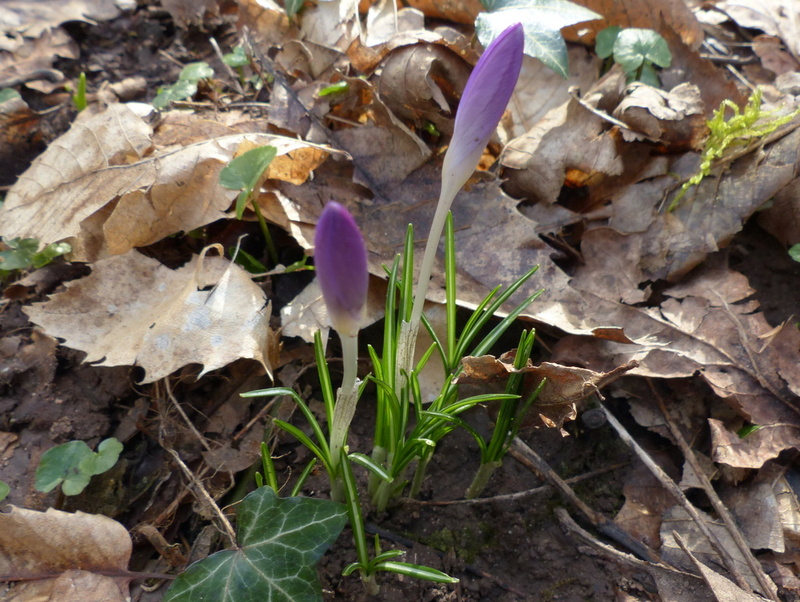 Tommies = crocus? Or something else? Oh! I see, the Latin. Wonderful post, as usual, Colin. Thank you Maggie 🙂 Named after Muzio Giuseppe Spirito de Tommasini, Botanist and Mayor of Trieste. I am sure that he has got a whole bunch of flowers named after him, including the Tommies but right now I can’t find a list. You are an amazing individual. 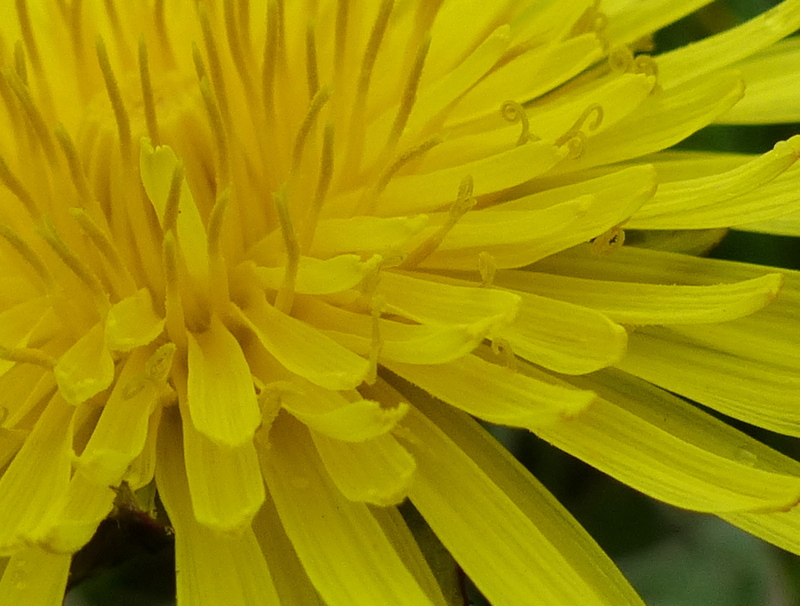 Everything you wanted to know about dandelions but never dared to ask. Excellent. Thank you Andrew 🙂 A very good flower for the birds and the bees. I didn’t know there were so many different dandelions. Always learning new stuff here 🙂 Love Fizz’s asking for a play date and chasing the new ball. My dog Wren was very interested in the video, I think she wants one, too. 😉 I really think we have enough squeaky toys, however! LOL – I look forward to that. I’m sure they have interesting things to share and would gain lots of followers! Thanks again for making the ordinary and commonplace so fascinating. Until we got to the bee I was going to remind you that it would be helpful for us (even if a nuisance for you) if we had a size measurer on each different flower. In my vegetable book by Phillips, Roger & Rix, Martyn they always have a wedding ring dropped next to a plant. In my case it would make a good use for a wedding ring. As ever, a valid comment. 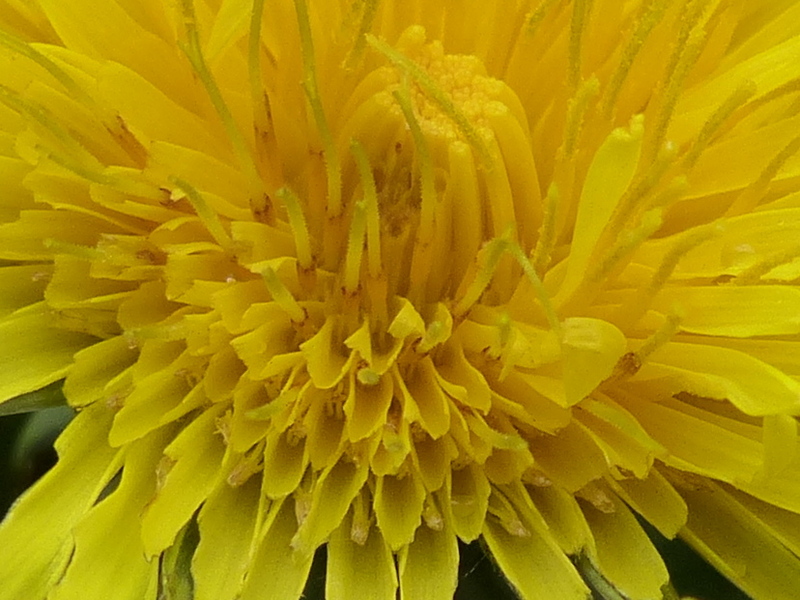 Thank you for sharing your knowledge, I have learnt a lot of new things about dandelions. Gorgeous photos of the bees. Glad to hear you’re making good progress with Mr. (or Mrs) Robin. Thank you Emily 🙂 Wild flowers are coming up everywhere now, there will soon be plenty of food for your little bees. The little Robin gets cheekier by the day but there is still some way to go. Dandelion tyres??? Who knew? What a fascinating post. Thank you Elouise 🙂 As I said in an earlier comment wild flowers and garden cultivars play different roles. The garden is just an ornament to make a house look pretty and a place to relax. The wild native plants support the life around us, they provide the larval food plants that insects need to survive. Gardens do provide some nectar plants and some garden species, like the Buddleia integrate really well but there is much more life in the tangled mess of the hedgerow than you would ever find in a garden. I think that there is always a case for a wild part in even the best maintained garden and a bird table and a pond. I do like a well kept garden, I just don’t know much about them. Thanks for this response. On balance, it helps me view our yards as more friendly to wildlife than I would have thought. Plenty of native plants and wildflowers. Also some nicely kept spaces. Lots of good hedges, vines, shrubs and trees for birds to hide and nest in..I’m feeling better about mowing down the dandelions! Decline in the bee population has been dramatic in the last years. A sad and tangled mess in itself–as to who/what is responsible. Yaaay !! Thank you Trini 🙂 Fizz loves it. Your days make my days. Only Primulas in our garden so far. It’s grim up north! Thank you John 🙂 There is not a great deal coming up in our garden. We have got Primulas of dubious origin.. There seems to be more going on in the hedgerow than in the garden. 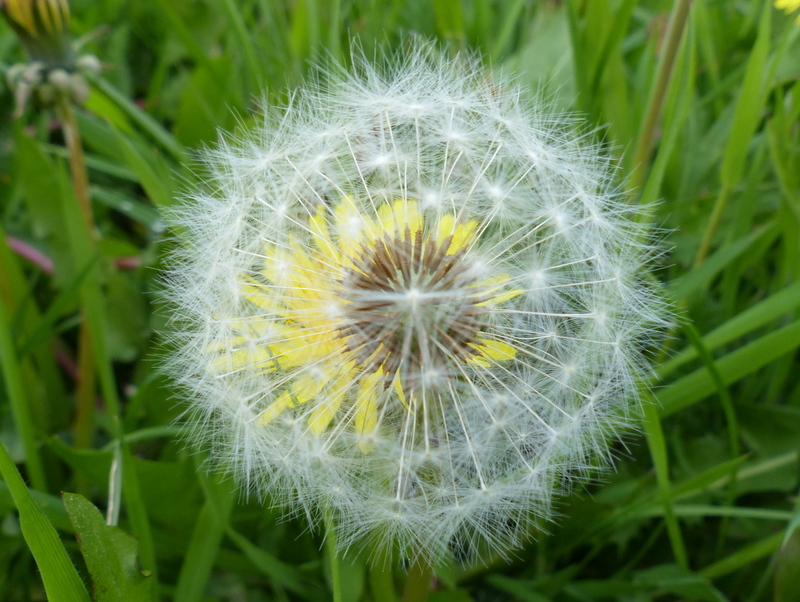 Love the dandelion photos and information. One of my favorite flowers and I do allow them in my garden. Thank you 🙂 I loved your Dandelion post especially the Rolling Stones, I haven’t heard that song in years. 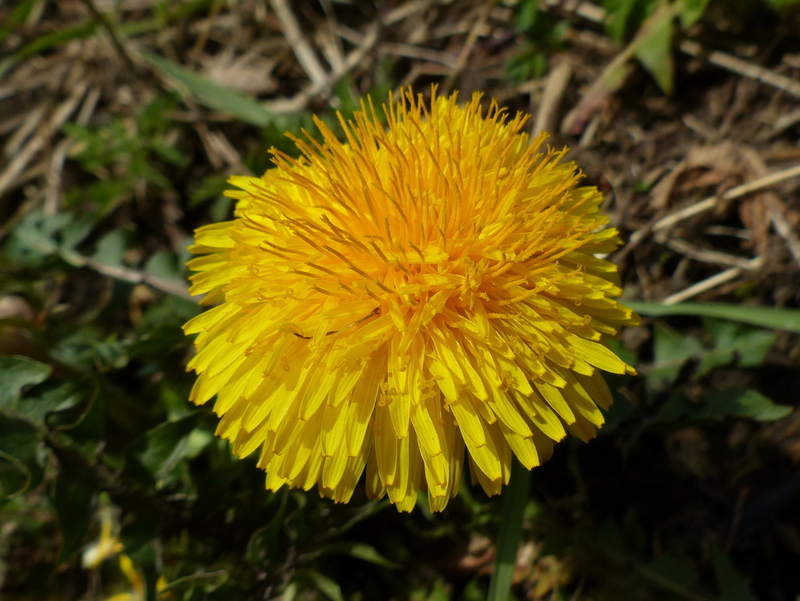 Thanks for checking out the Dandelion post with my photos and basic info on dandelions along with the recipe videos and the Stones’ song. Thought the song added to the post. I don’t think I will ever look at a dandelion quite the same way! Marvelous. Will be looking for updates on your little feathered friend. Oh my! So much to take in! First off tho’….I AM so happy that Mr. Robin eats from your hand now. I saw in another Blog that he brushed your fingers in a fly over and thought…it won’t be long. I learned a great deal about the dandelion. It is a lovely flower, as you have made us aware. And the young, tender stems are delicious. In the Spring our Mum would take we youngsters “to the field” to gather enough to make a hardy side dish for a meal. Delicious! The UK has so many beautiful flowers….and if we looked down more we would find that we have beauty that has gone unnoticed. What a great Blog, Colin. Thank you. Thank you Ettel 🙂 Beauty unnoticed? 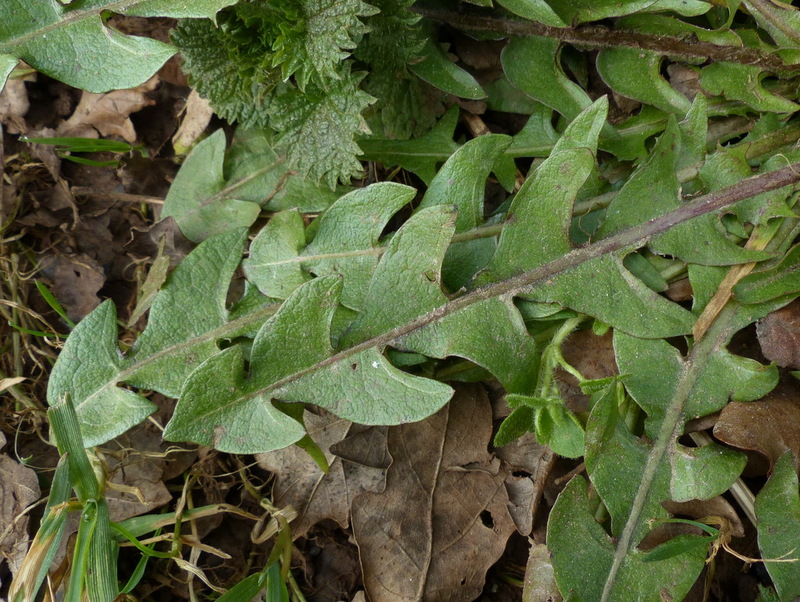 Today I am trying to photograph and write about the Common Groundsel. A very unnoticeable little weed but guess what? it is lovely if you look closely. Thank you for the nice comment about the Robin, he lands on my hand quite happily now at about two inches above the ground, he still thinks that I am Mr Bendy Man and should get on the floor to feed him but it won’t be long. I, for one, believe you are destined to become faithful friends. Brilliant photography, especially of your red breasted friend…what a handsome bird. I leave the dandelions in the garden as they are a favorite snack for the tortoise. haha :- ) Little ‘mudface.’ Nice to hear sound with Fizz too! 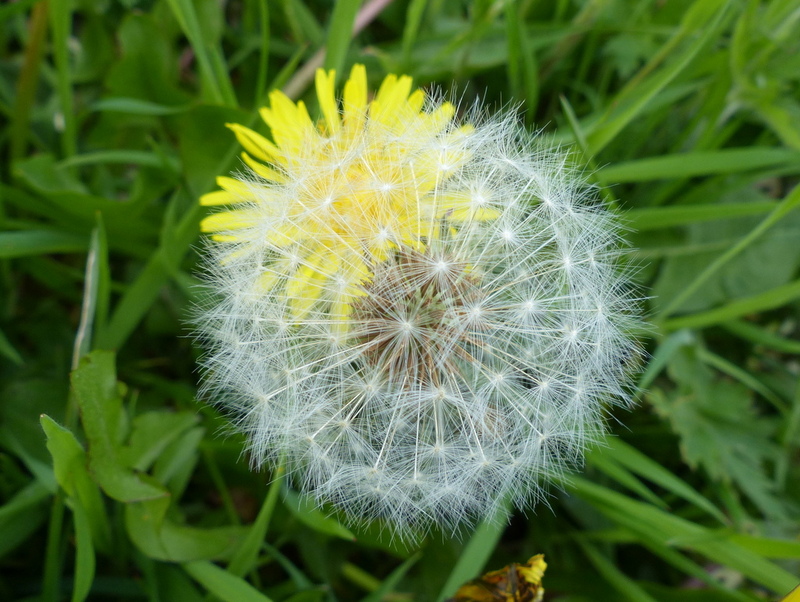 Great photos and those closeups of the ‘seedhead’ or ‘dandelion-clock’ – Just beautful. Really something! Very nice especially your dog – so adorable! Such a spring joy in you post! You made me happy as it really looks like first fowers are here! I’ve found some snowdrops in my garden and can’t wait to go for a walk and post a spring report of your kind! 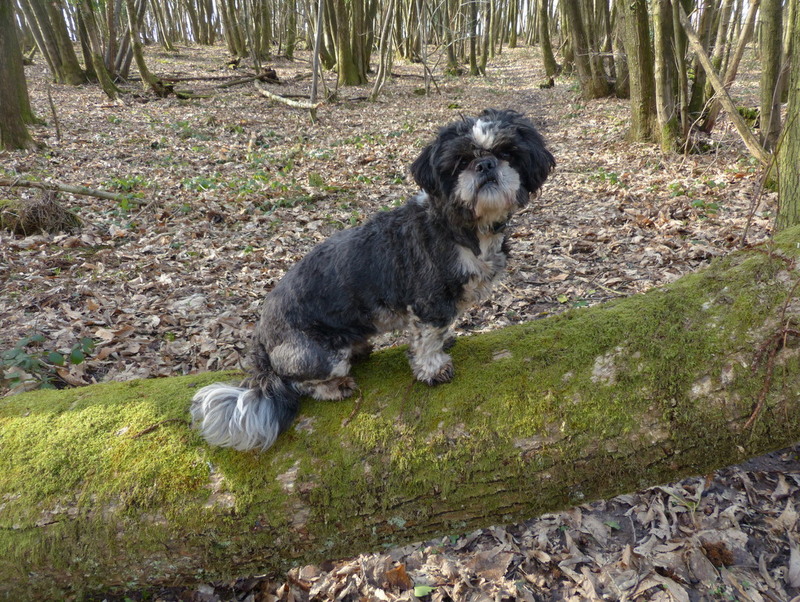 Except the dog of mine is a cocker, mud loving Charlie!